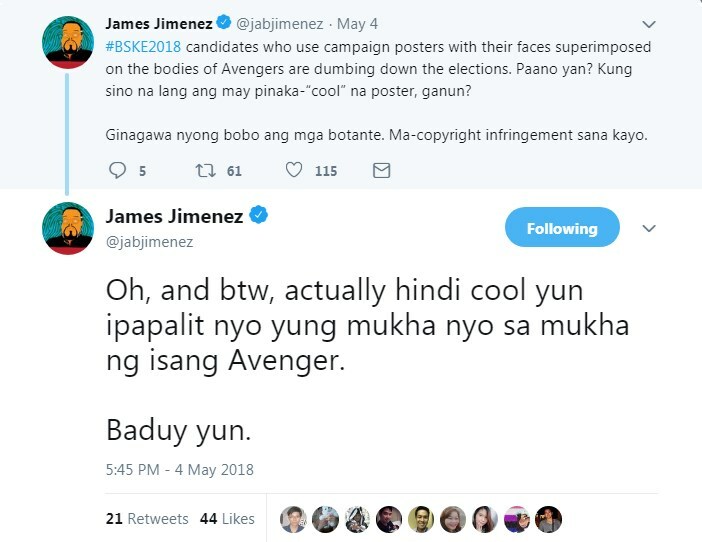 Comelec spokesperson James Jimenez called out barangay and SK election candidates who edit their faces onto the images of the Avengers. He even mentioned the risk that these candidates may be sued for copyright infringement. 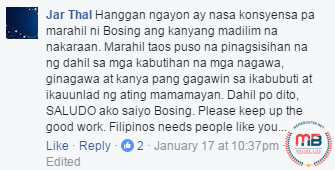 “Ginagawa nyong bobo ang mga botante. Ma-copyright infringement sana kayo,” he continued. In a separate tweet, Jimenez said that putting their faces on the bodies of the Avengers is definitely not a cool move but a “baduy” one. “Oh, and btw, actually hindi cool yun ipapalit nyo yung mukha nyo sa mukha ng isang Avenger. Baduy yun,” he tweeted. However, Jimenez said that the Comelec does not have the authority to ban the use of such campaign posters because it can already be considered as “content-based prior restraint.” He added that the poll body only has control over the size of the posters used and where they are displayed, which should be in the “common poster areas” previously determined by Comelec election officers. The posters will only be deemed illegal “if it is posted outside of the common poster area,” Jimenez said. But even then, there is an exception to the rule – “to display the materials on private property with the permission of the owner,” he added. On April 11, Comelec released a resolution prohibiting campaign materials to be posted on trees, electrical wires, light posts, waiting sheds, schools, bridges, traffic signs, sidewalks, public shrines, barangay halls, airports, health centers, seaports, public transport terminals, trains and train stations, ambulances, government patrol cars, underpasses and overpasses, public announcement boards, and center islands. According to Comelec Resolution No. 10294, candidates can only use posters that are up to 2 feet by 3 feet in dimension. Rally streamers should not be bigger than 3 feet by 8 feet and should be taken down right after the event. The nine-day campaign period for the barangay and SK elections started at 12 a.m. on May 4 and will continue until May 12, two days before the election on May 14. Eat Bulaga host and comedian Vic Sotto allegedly came to the defense of President Rodrigo Duterte’s supporters, based on a meme that was shared by a Duterte Facebook fan page. 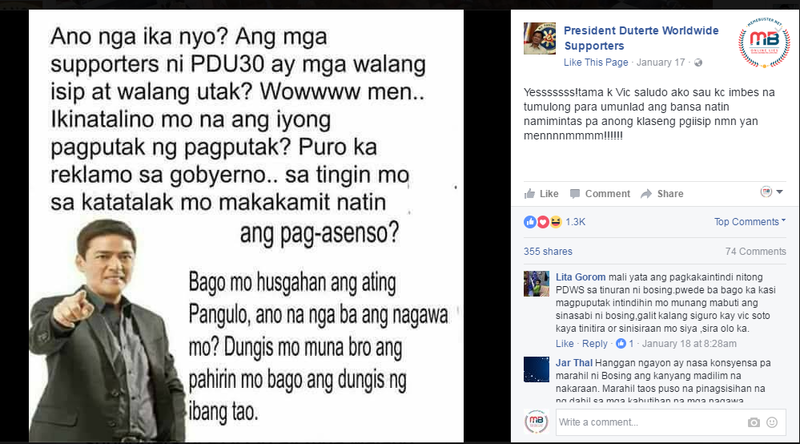 What’s worse is that it has received hundreds of shares and comments from netizens commending Sotto for what he allegedly said about the president’s supporters. It also bore Sotto’s photo. 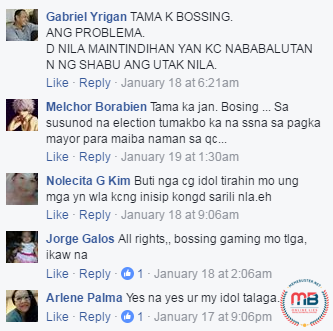 And here are the comments that showed how netizens readily bought the statement in the meme as something that Sotto actually said. However, one netizen was right to ask for a video of Sotto actually uttering the statement in the meme. It’s just right to doubt the meme’s claim because it is totally untrue! Sotto never said those words. If we were to look into the political endorsement Sotto made during the campaign for the May 2016 elections, he and his wife, Pauleen, endorsed the candidacies of Senator Grace Poe for President and Senator Francis Escudero for Vice President. False memes were used during the campaign to fake endorsements for the different political candidates. It appeared that some people are still using the trick even after the election was over. In fact, this was way Meme Buster came to life – to bust memes and fake news and find the truth. How sure are you that the article you’re seeing on your Facebook News feed now is genuine or not? You can always use Google or any other search engines to verify the articles, but many people often neglect this step, making them vulnerable to websites deliberately sharing fake articles or sites that meant to create fun by making satire articles out of trending topics. Meme Buster was, in fact, created to counter the lies online. After busting hundreds of memes and lies, we’ve come up with a list of websites that are fond of posting fake articles and websites with disclaimers that they are sharing satirical articles. We’ll keep updating this list as we encounter more sites with made-up stories. 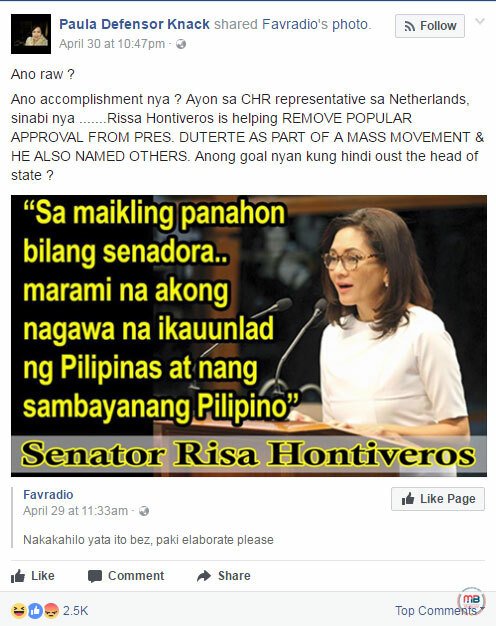 Pinoy Speak (Duterte News) posts satirical articles and passes them off as real news, such as Senator Manny Pacquiao giving $5 million for Duterte’s drug war and the showing of Agot Isidro and alleged drug lord lover’s video in the Senate. It also shares fake articles, such as Jackie Chan begging to make a movie out of Duterte’s first 100 days; Jaybee Sebastian linking PNoy to drugs; Sebastian engaging in an affair with Senator Leila de Lima in exchange for drug protection; Senator Antonio Trillanes IV receiving a P500-M check to destroy Duterte, among others. This meant it does not bother checking its sources. Some of DW-TV3’s articles may look like satire articles, but the site’s “About Us” page did not say anything about it being a satire site. 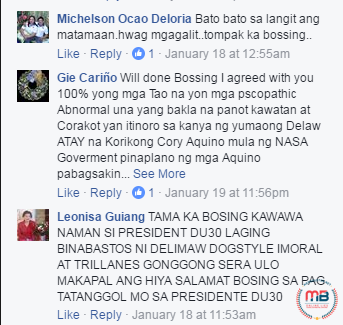 Meme Buster has busted several articles posted by this site, including the Canadian PM Justin Trudeau praising Duterte’s drug war, UN Secretary-General Ban Ki-moon calling Duterte “brave”, Hillary Clinton showing Duterte some love or calling him “the world’s man”, and Agot Isidro dating drug lords. Click on the button for more FAKE and SATIRE sites.